Two tries each from Brett Stewart and Anthony Watmough helped Manly beat Leeds 28-20 and win the World Club Challenge for the first time on Sunday. The Elland Road victory also ended Super League’s five-year monopoly on the trophy. Stewart and the outstanding Watmough scored a try either side of the break but the Australian team’s three-try burst in the opening seven minutes of the second period proved decisive. Keith Senior, Ryan Hall and Danny McGuire restored some respectability with late tries, but the Leeds Rhinos, who were bidding to become the first team to retain the title, were never in the hunt. Leeds received a huge boost before kick off with England scrum-half Rob Burrow passing a fitness test on the back injury that had forced him out of the first three games of the season. But Australian international Watmough ended Burrow’s night in the 16th minute when he flattened him with a high tackle. A scrappy opening quarter, which was dominated by NRL referee Jason Robinson’s whistle, finally boiled over in the 20th minute. No.10s Jamie Peacock and Josh Perry were sent to the sin-bin for a punch-up and that lit the fuse for a fantastic end to the half. 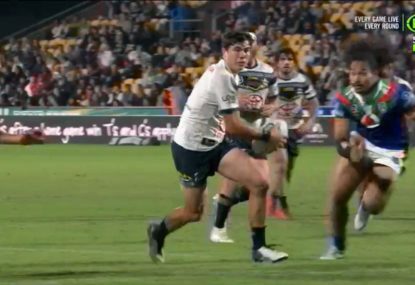 From the resulting penalty Manly worked the ball close to the line with full-back Stewart eventually scrambling over from close range and captain Matt Orford added the extras. The Sea Eagles had a second try eight minutes later. Australian international Watmough charged onto Orford’s delayed pass, broke the line and raced past full-back Lee Smith to touch down. Orford again converted for a 12-0 lead but they blew a golden chance for a third try in the 32nd minute. 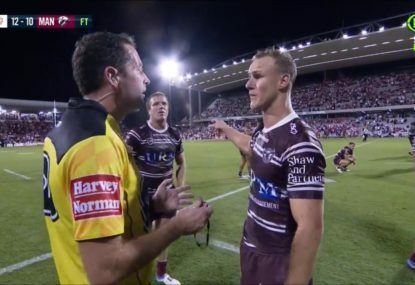 Watmough found Brett Stewart but he failed to gather the ball with the line at his mercy. 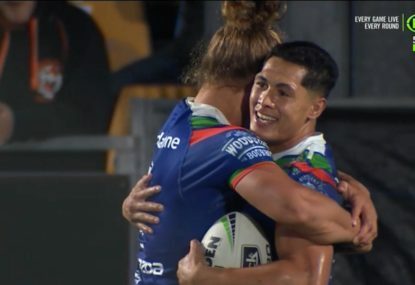 The Super League champions made the most of their let-off to grab a lifeline three minutes before the break. Glenn Stewart made a meal of Kevin Sinfield’s kick and McGuire was held up on the line by a superb Orford tackle but the ball came loose and Jamie Jones-Buchanan touched down. Robinson left the final decision with video referee Steve Ganson and he gave Leeds the benefit of the doubt but Sinfield missed the kick to give Manly a 12-4 lead at the break. Manly took control of the game with three tries in the first seven minutes of the second half. 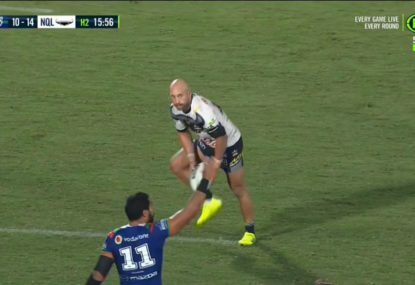 Brett Stewart, who scored 22 tries in the 2008 NRL season, made amends for his error in the first half by racing clear after quick hands on the left in the 43rd minute. Orford missed the conversion but two minutes later another break on the left by Michael Robertson ended with Watmough crashing over for his second effort with Orford converting. On 47 minutes, substitute Shane Rodney broke through the Rhinos’ weary defence, fed Heath L’Estrange and he sent in centre Steve Matai in the corner. England centre Senior reduced the arrears 15 minutes from time after good work from Ali Lauitiiti with Sinfield closing the gap to 26-10 with a successful conversion. Former New Zealand Warrior Lauitiiti then sent in Hall at the corner with Sinfield again converting as the Rhinos mounted a spirited comeback. Orford extended the advantage to 28-16 with a 76th minute but the Rhinos had the final say when McGuire was sent clear by Senior to touch down in the last minute.